Profile for cable distribution with external cover, suitable for outdoor use. It has flexible compartmentation for the conduction and protection of electrical and communication cables. The base is perforated every 250mm. 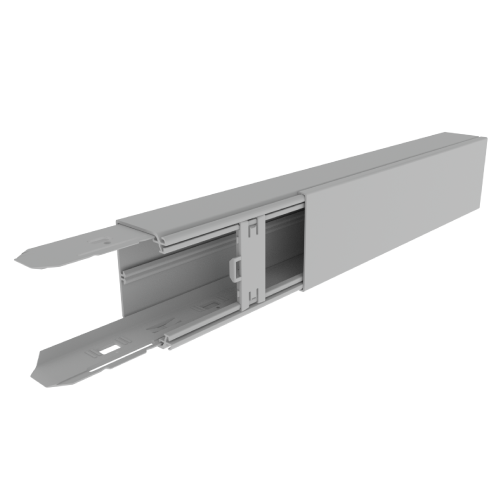 With the trunking are supplied, a retainer every 0.5m and two junctions. These parts come pre-assembled. Length: 3m. Safety: mechanical (impact protection IK08), electrical (insulating material, IP4X mounted on the wall) and in case of fire (incandescent wire test at 960 ° C, no flame propagator). The cover assembly is made under pressure (it is not necessary to slide to mount it). The retainer keeps the cables in place ensuring the fixing of the cover in the most demanding cases. The junctions mechanically join two sections of trunking guaranteeing its perfect alignment, facilitating the assembly and fixing of the bases on the surface. Both the trunking and the finishing elements can be painted. Mobile divider with front mounting. Colour: grey RAL 7035.